Hudson – Maria J. 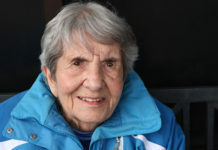 (Braga) Resendes, 91, died Tuesday June 21, 2011, surrounded by her loving family, at Marlborough Hills Healthcare Center. She was the wife of 69 years to the late Antonio Resendes, who died in 2009. Born and raised in Santa Maria, the Azores, Portugal, the daughter of the late Antonio J. and Bernardina J. (Freitas) Braga., she moved to Hudson in 1968 and was employed as an assembler by the Hudson Lock Co. for 15 years until her retirement. She was a member of Saint Michael&apos;s Parish in Hudson. Mrs. Resendes is survived by her two daughters, Maria B. Cabral and husband Jose of Hudson and Helena Leonardo, wife of the late Manuel Leonardo, of Canada. She was predeceased by her daughter, Maria Resendes. She is also survived by her five grandchildren, Darren, Sandra and Leslie Leonardo and Elvis and Fatima Cabral, and her three great-grandchildren. She was predeceased by her grandson, Harry Leonardo, and her four siblings, Emilia Sousa, Conceicao Figueiredo, Maria Loura and Jose Braga. A funeral Mass will be celebrated Saturday June 25, at 9 a.m., in Saint Michael&apos;s Church, 21 Manning St., Hudson. Burial will follow in Saint Michael&apos;s Cemetery. Calling hours will be held Friday June 24, from 5 to 8 p.m., at the Tighe-Hamilton Funeral Home, Inc., 50 Central St., Hudson, MA 01749. For online condolences, please visit www.tighehamilton.com.